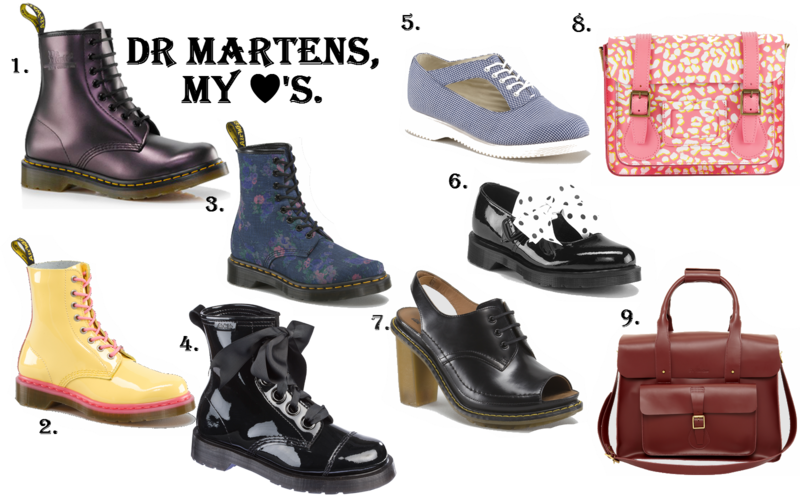 I having a total obsession with Dr Martens, whether it's boots, flats or bags,I just love them. I wish I had an unlimited supply of money because Dr Martens are not the cheapest of the bunch, but they are copies of them every where, but when it comes to Dr Martens I feel like you can't beat the real thing! These all so cool, it makes me laugh how my style goes from girly school-girl to grunge-alert! I don't really think I have a style, some days I love a floaty skirt with shoes like the dotty cut-out ones here. Or something like my 'homies' t-shirt with the purple tinted boots, maybe I just like the change it up a little! Enough of my rambling though.. moving on to the items! 1.1460 W Boot- These are the classic DM style boots, just with a bit of a re-vamp on the colour. I love the shimmer on it just takes a different route from the standard matte or shiny finish. 2.Pascal Boot- These are gorgeous, if I had seen these before I brought my white DM's I would probably have just got these instead. I feel like they maybe quite difficult to style as there is just so many colours to them! 3.Castel Boot- I just love flower print on shoes, and on boots it just loves even cooler. The denim coloured fabric just makes it awesome, if you wanted to attempt the double denim look a good start would be pairing a denim shirt with these if your a bit scared of this trend. 4.Grace Boot- These are sooooo cute, I just love the ribbon being used as laces, I think it looks great against the shininess of the boots. 5.Caryen Shoe- I adore these! The cut-out detail is just so cute, pairing these with some white lace socks, a white summer dress and a trilby hat. 6.Mariel Shoe- I would feel like a was back in primary school with these shoes on but I don't even care, I need them in my life. They also have versions with plain black ribbon on the them and I'm not sure which I prefer!? 7.Tara Shoe- Got to have a pair of heels in here somewhere! These just look like brogues with a heel which I think it so cool, the peep toe and the sling back is a really nice touch as well, with some skinny jeans and a really nice jacket these would look gorgeous. 8.11" Leather Satchel- I just love the pattern on this bag, I'm going to say its like a yellow,white and pink leopard print-but it's probably not!- I'd love to have this bag to add a pop of colour to a monochrome or just boring outfit. 9.Leather Holdall- This is such a sophisticated bag, adding this to the outfit with the peep toed heels would just be perfect. I love the burgundy colour and just the smoothness of the bag just makes it look much more expensive than it actually is. I hope you enjoyed this post and maybe tempted you to invest in some Dr Martens item of your own, as I know this post has definitely tempted me! See you soon, becciixx. I'm sooo in love with dr martens as well!! I love the first one -i really gotta splurge on one pair! 2 and 4 are perfect, nice selection! I have been in love with Docs for as long as I can remember! I wore a brand new pair on a recent trip to NYC-they were so comfortable, walked around the city in them for 5 days without my feet hurting once!